In our last 2 blogs we discussed 7 important aspects of designing an effective point-of-purchase display. In this blog, we’ll consider 3 more key aspects of effective design. In their widely acclaimed baby naming book “Beyond Jennifer and Jason,” the authors argue that the best names for children are ones that make them stand out yet fit in. And so it is with retail displays. The challenge is always to stand out, to differentiate your product, to be unique and distinctive. However, in the world of visual merchandising, there’s a fine balance between standing out and fitting in within the overall décor of the store environment. An example of a shelving display rack that stands out yet fits in is an end cap display we designed and manufactured for The Honest Kitchen. 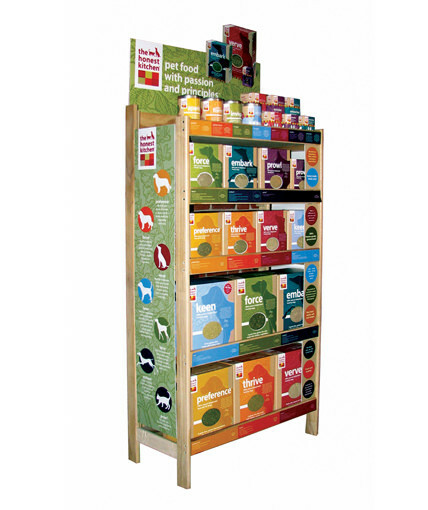 We created a solid wood shelf display with a natural finish and organic feel to reinforce the features of our customer’s line of natural dehydrated pet food, but we added high-impact header, side, and shelf graphics that helped both the display and the product stand out. Although this display rack stood out, it also fit in with the wide range of independent pet store environments in which it was placed. Selecting the right type of display to meet your marketing and sales objectives is an important step in the design process. One of the first things to decide is whether it is better to go with a temporary display or a permanent display. Temporary displays, often referred to as shippers, shipper displays, corrugated displays, or cardboard displays, are generally used for in-and-out promotional or seasonal programs. However, in our experience many customers who do not have promotional programs initially gravitate toward corrugated displays to save money. What they don’t realize is that temporary displays can often end up costing more over time than a permanent retail display. The reason is that with corrugated displays, once the product sells through the display is usually tossed by the retailer and needs to be replaced. In addition, most shippers are less durable and may not last more than 6 or 8 weeks in a busy, regularly maintained store environment. Corrugated displays are typically seen as disposable and are more likely to be discarded at the whim of a retail district manager. Finally, corrugated display costs are generally more sensitive to volume than permanent displays in the lower quantity ranges so small quantities of custom corrugated displays can be pricey, particularly if the design is graphic-intensive. If you think a permanent display is better suited to meet your objectives, it is important to determine the type of display that makes the most sense. This decision is often contingent on store plan-o-grams and the specific location where your display will likely be placed. Generally, securing off-shelf placement is more desirable since freestanding displays tend to generate more product sales than inline placement for most products. End cap displays represent prime retail real estate. Simply moving product from an inline gondola location to an end cap location can drive a meaningful increase in sales. For example, the Pepsi end cap we built for Kroger stores drove an immediate double-digit increase in sales compare to sales generated by the previous inline location. Beyond end cap displays, there are dozens of different types of point of sale and visual merchandising options available, such as tabletop stands, counter displays, floor standing displays, wall mount racks, pegboard displays, slatwall displays, slatgrid fixtures, basket displays, dump bin displays, floor shelf displays, hanging displays, locking display cases and glass display showcases, nesting tables, grid fixtures, fold-out wire shelf displays, counter and floor hook spinners, banner stands, and many other types of displays that are product-specific such as sunglass displays, eyewear displays, cap racks, hats displays, magazine racks, apparel displays, clothing racks, accessory displays, food displays, beverage displays, cosmetic displays, jewelry displays, earring displays, CD displays, toy displays, garment racks, greeting card racks, nail polish racks, necklace displays, newspaper racks, postcard racks, poster displays, shoe displays, t-shirt displays, watch displays, footwear fixtures, wine displays, etc. Selecting the right type of display can not only have an impact on your sales, but it can affect your brand image and your product’s perceived value. For example, selecting a dump bin fixture might be just the right merchandising strategy for your “Grab N’ Go” program, but it would be important to consider the impact on your brand image since most shoppers associate dump bins with clearance merchandise or lower value products. Space allocations may vary according size and location of store. Product mix requirements may change. Individual store layouts may differ. Seasonal or promotional opportunities may become available. Designing for modularity and configurability is akin to the manufacturing concept of mass customization. Not only are there benefits in terms of meeting retailers’ needs and increasing opportunities for retail display placement, but there are important economic benefits that arise from being able to replace fixture parts and components rather than complete fixtures in the event of fixture damage, obsolescence, or plan-o-gram changes. Two good examples of modular and configurabl e designs come from our stock line of store fixtures. The first example is our SFL line which we designed around a single heavy-duty steel frame on castors with an MDF panel insert. These steel frames with panels can be configured in a number of ways to create completely different displays. With just one common panel it is possible to create a pinwheel display, an “H” rack, a t-sided fixture, and a mobile gondola fixture. 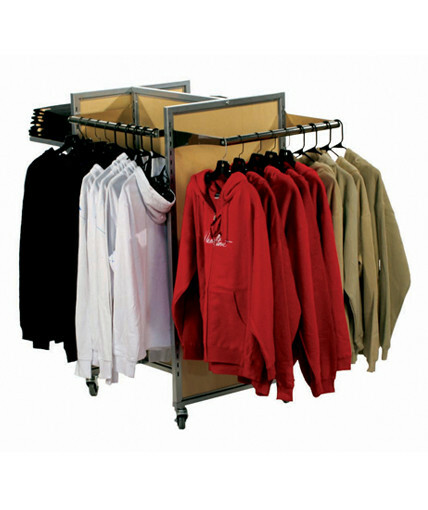 Once a basic configuration is established, customers can choose from a variety of fixture accessories such as shelves, apparel hanging bars, crossbars, waterfalls, straight-outs, cap pockets, hooks and sign holders. Further customization is possible by adding branded header graphics and changing out stock maple laminate panels for graphical panels or other finishes. A second example from RICH LTD.’s stock line is our 4-WAY fixture. 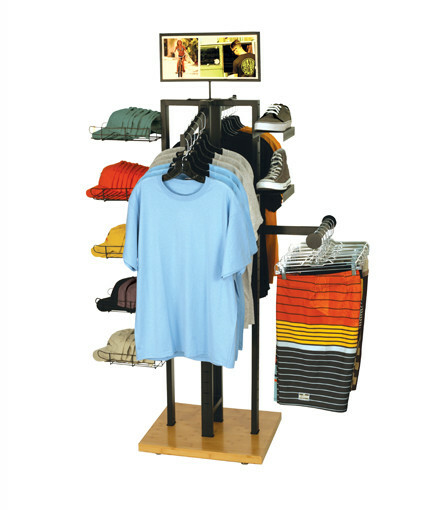 This apparel fixture features an MDF base with a bamboo veneer finish and a 4-sided slotted metal tube structure. The display can be configured in many different ways using accessories such as waterfalls, straight-outs, jet rails, cap pockets, shoe shelves, and a header sign holder. It’s a great example of how to use a display to cross merchandise complimentary apparel accessories and how one display can meet a wide range of merchandising needs.